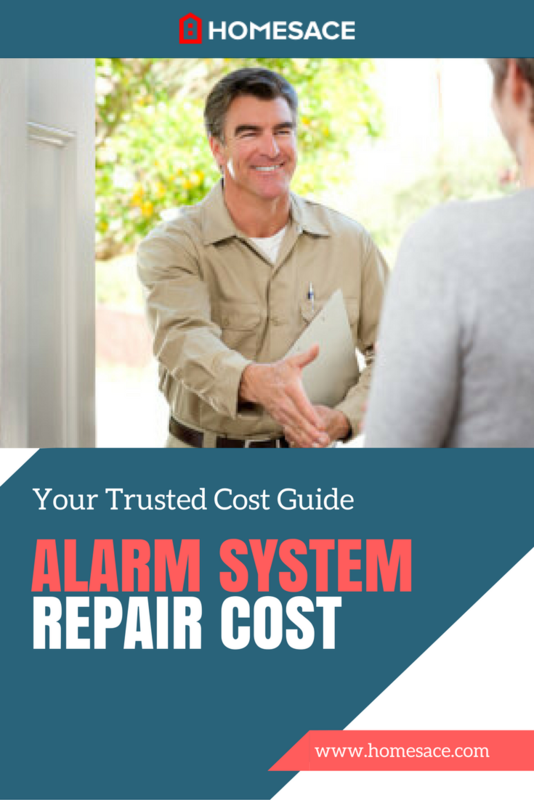 How Much Does Alarm System Repair Cost? If you’ve equipped your home with a modern security system, you’ve already invested a significant amount of money in your family’s safety. A malfunctioning security system should be repaired immediately, and alarm system repair will require either a licensed electrician or a technician from your security company. Most security systems work by building basic circuits in your home. Your doors and windows, when closed, complete a circuit. When the circuit is broken, an alarm sounds. The alarm can be disabled by entering a code but if the disabling code isn’t entered the alarm will persist, and police will be notified via an alarm monitoring system. Your alarm system repair costs will vary based on which element in your existing system is compromised. How Much Will It Cost To Repair an Alarm System? The average cost to repair an alarm system can vary quite a bit based on the above factors. The cost will run $100 at the low end, $500 at the top end, with the average cost roughly $200. False alarms: False alarms are problematic because they can result in unnecessary responses from law enforcement. Some municipalities will fine for faulty alarm system calls and, of course,you and your family will be startled and frustrated by false alarms as well. Your technician can help ascertain whether the problem is a faulty door or window alarm contact. Power supply or battery replacement: Your technician has access to proprietary parts that may only be sold by your security company, and the cost to repair an alarm system is often dependent on the prices of those parts. Wiring issues: Like with any other electrical issue, your wiring should be inspected for loose connections, necessary updates, and hazards during your alarm system repair. If you’re paying for a monitored security system, your alarm system repair may be covered under your existing contract. Ensure that you don’t pay more than you have to by checking with your security provider first, and ask about reimbursement for repairs if you do need to hire an electrician. Remember that your location will make a big impact on this cost, so you’ll need to contact a local professional for an estimate on the cost to repair your alarm system. Start now by entering your home zip code on this page, and you will receive a FREE estimate from a specialist contractor. Remember, this offer is 100% FREE, and there are no-obligation whatsoever, so enter your zip code now to consult with someone in your area.